During a birthday party, a demon emerges from a TV set that's playing the same film that was screened in the original film, and possesses a whiny teenage girl (Coralina Cataldi Tassoni) who will soon have more to worry about than her hair and dress. One by one, tenants living in the same highrise apartment building (who naturally become trapped inside) are transformed into the same ugly, possessed killers with fangs and claws that we saw in the first film. The large building undoubtedly makes a great setting for this type of film (as it did for Cronenberg's SHIVERS), with scenes taking place in long hallways, vent shafts, the elevator shaft, a parking garage, a TV studio and even a gym full of muscleheads, it's well photographed and the gore make-up (by Rosario Prestopino and others) and special effects are also above average. Unfortunately, that doesn't save this from being a subpar and childish rehash of the first film. There are lots of silly characters doing silly things throughout, all atrociously dubbed, of course, plus a demon dog, a miniature demon puppet monster (for some GREMLINS-like action), throats ripped out, bodies thrown off rooftops and impalements. It ends with "Here Comes the Rain" by The Cult and also features music by Dead Can Dance, Simon Boswell, The Smiths and Love and Rockets. Dario Argento co-wrote (with Bava and two others again) and produced. Over five minutes were cut from the initial American release to get an R rating, making some of the scenes seem choppy, even incomprehensible in the VHS version. The gore scenes have been restored for the DVD release. David Knight and Nancy Brilli star, along with a young Asia Argento (in her first horror film), Virginia Bryant (from one of the other sequels), Davide Marotta (who played the little killer in Argento's PHENOMENA) and Antonio Cantafora. Many cast members from the original (Bobby Rhodes, Lino Salemme, Eliana Hoppe...) also return, but play different characters here. Other Demons movies, some of which aren't even related and were just retitled for international distribution, include: DEMONS 3, which was the proposed title for LA CHIESA (aka THE CHURCH, 1989), but was instead used for THE OGRE (1988) and BLACK DEMONS (1991). 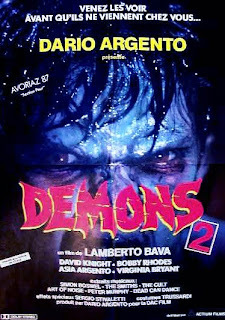 DEMONS 4 is Soavi's LA SETTA (aka THE DEVIL'S DAUGHTER, 1990) and DEMONS 5: THE DEVIL'S VEIL is LA MASCHERA DEL DEMONIO (1989), which was also made by Lamberto Bava. And DEMONS '96 was a production title for CEMETERY MAN.